These days, many retailers and manufacturers are tracking their products using RFID, or radio-frequency identification tags. Often, these tags come in the form of paper-based labels outfitted with a simple antenna and memory chip. When slapped on a milk carton or jacket collar, RFID tags act as smart signatures, transmitting information to a radio-frequency reader about the identity, state, or location of a given product. In addition to keeping tabs on products throughout a supply chain, RFID tags are used to trace everything from casino chips and cattle to amusement park visitors and marathon runners. The Auto-ID Lab at MIT has long been at the forefront of developing RFID technology. Now engineers in this group are flipping the technology toward a new function: sensing. They have developed a new ultra-high-frequency, or UHF, RFID tag-sensor configuration that senses spikes in glucose and wirelessly transmits this information. In the future, the team plans to tailor the tag to sense chemicals and gases in the environment, such as carbon monoxide. "People are looking toward more applications like sensing to get more value out of the existing RFID infrastructure," says Sai Nithin Reddy Kantareddy, a graduate student in MIT's Department of Mechanical Engineering. 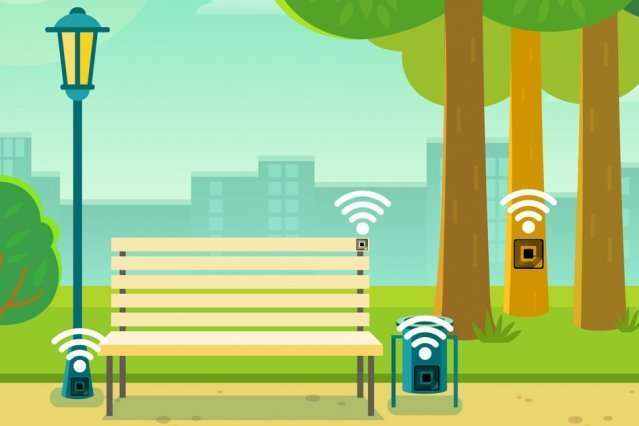 "Imagine creating thousands of these inexpensive RFID tag sensors which you can just slap onto the walls of an infrastructure or the surrounding objects to detect common gases like carbon monoxide or ammonia, without needing an additional battery. You could deploy these cheaply, over a huge network." Kantareddy developed the sensor with Rahul Bhattacharya, a research scientist in the group, and Sanjay Sarma, the Fred Fort Flowers and Daniel Fort Flowers Professor of Mechanical Engineering and vice president of open learning at MIT. The researchers presented their design at the IEEE International Conference on RFID, and their results appear online this week. "RFID is the cheapest, lowest-power RF communication protocol out there," Sarma says. "When generic RFID chips can be deployed to sense the real world through tricks in the tag, true pervasive sensing can become reality." Currently, RFID tags are available in a number of configurations, including battery-assisted and "passive" varieties. Both types of tags contain a small antenna which communicates with a remote reader by backscattering the RF signal, sending it a simple code or set of data that is stored in the tag's small integrated chip. Battery-assisted tags include a small battery that powers this chip. Passive RFID tags are designed to harvest energy from the reader itself, which naturally emits just enough radio waves within FCC limits to power the tag's memory chip and receive a reflected signal. Recently, researchers have been experimenting with ways to turn passive RFID tags into sensors that can operate over long stretches of time without the need for batteries or replacements. These efforts have typically focused on manipulating a tag's antenna, engineering it in such a way that its electrical properties change in response to certain stimuli in the environment. As a result, an antenna should reflect radio waves back to a reader at a characteristically different frequency or signal-strength, indicating that a certain stimuli has been detected. For instance, Sarma's group previously designed an RFID tag-antenna that changes the way it transmits radio waves in response to moisture content in the soil. The team also fabricated an antenna to sense signs of anemia in blood flowing across an RFID tag. But Kantareddy says there are drawbacks to such antenna-centric designs, the main one being "multipath interference," a confounding effect in which radio waves, even from a single source such as an RFID reader or antenna, can reflect off multiple surfaces. "Depending on the environment, radio waves are reflecting off walls and objects before they reflect off the tag, which interferes and creates noise," Kantareddy says. "With antenna-based sensors, there's more chance you'll get false positives or negatives, meaning a sensor will tell you it sensed something even if it didn't, because it's affected by the interference of the radio fields. So it makes antenna-based sensing a little less reliable." Sarma's group took a new approach: Instead of manipulating a tag's antenna, they tried tailoring its memory chip. They purchased off-the-shelf integrated chips that are designed to switch between two different power modes: an RF energy-based mode, similar to fully passive RFIDs; and a local energy-assisted mode, such as from an external battery or capacitor, similar to semipassive RFID tags. The team worked each chip into an RFID tag with a standard radio-frequency antenna. In a key step, the researchers built a simple circuit around the memory chip, enabling the chip to switch to a local energy-assisted mode only when it senses a certain stimuli. When in this assisted mode (commercially called battery-assisted passive mode, or BAP), the chip emits a new protocol code, distinct from the normal code it transmits when in a passive mode. A reader can then interpret this new code as a signal that a stimuli of interest has been detected. Kantareddy says this chip-based design can create more reliable RFID sensors than antenna-based designs because it essentially separates a tag's sensing and communication capabilities. In antenna-based sensors, both the chip that stores data and the antenna that transmits data are dependent on the radio waves reflected in the environment. With this new design, a chip does not have to depend on confounding radio waves in order to sense something. "We hope reliability in the data will increase," Kantareddy says. "There's a new protocol code along with the increased signal strength whenever you're sensing, and there's less chance for you to confuse when a tag is sensing versus not sensing." "This approach is interesting because it also solves the problem of information overload that can be associated with large numbers of tags in the environment," Bhattacharyya says. "Instead of constantly having to parse through streams of information from short-range passive tags, an RFID reader can be placed far enough away so that only events of significance are communicated and need to be processed." As a demonstration, the researchers developed an RFID glucose sensor. They set up commercially available glucose-sensing electrodes, filled with the electrolyte glucose oxidase. When the electrolyte interacts with glucose, the electrode produces an electric charge, acting as a local energy source, or battery. The researchers attached these electrodes to an RFID tag's memory chip and circuit. When they added glucose to each electrode, the resulting charge caused the chip to switch from its passive RF power mode, to the local charge-assisted power mode. The more glucose they added, the longer the chip stayed in this secondary power mode. Kantareddy says that a reader, sensing this new power mode, can interpret this as a signal that glucose is present. The reader can potentially determine the amount of glucose by measuring the time during which the chip stays in the battery-assisted mode: The longer it remains in this mode, the more glucose there must be. While the team's sensor was able to detect glucose, its performance was below that of commercially available glucose sensors. The goal, Kantareddy says, was not necessarily to develop an RFID glucose sensor, but to show that the group's design could be manipulated to sense something more reliably than antenna-based sensors. "With our design, the data is more trustable," Kantareddy says. The design is also more efficient. A tag can run passively on RF energy reflected from a nearby reader until a stimuli of interest comes around. The stimulus itself produces a charge, which powers a tag's chip to send an alarm code to the reader. The very act of sensing, therefore, produces additional power to power the integrated chip. "Since you're getting energy from RF and your electrodes, this increases your communication range," Kantareddy says. "With this design, your reader can be 10 meters away, rather than 1 or 2. This can decrease the number and cost of readers that, say, a facility requires." Going forward, he plans to develop an RFID carbon monoxide sensor by combining his design with different types of electrodes engineered to produce a charge in the presence of the gas. "With antenna-based designs, you have to design specific antennas for specific applications," Kantareddy says. "With ours, you can just plug and play with these commercially available electrodes, which makes this whole idea scalable. Then you can deploy hundreds or thousands, in your house or in a facility where you could monitor boilers, gas containers, or pipes."